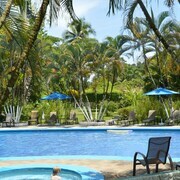 Situated near the beach, this spa resort is 1.3 mi (2 km) from Arco Beach and 2.7 mi (4.3 km) from Uvita Beach. Pinuela Beach is 1.8 mi (2.9 km) away. They allowed us yo check in earlier. Swimming pool and rooms are nice. 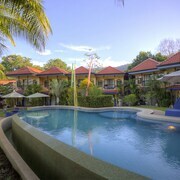 The hotel is 700 meters from Marino Ballena National Park. There is a supermarket 100 meters away. They serve a good breakfast with two options. I highly recommend this hotel for a quiet and relaxing stay in a tropical paradise. Where to find Dominical hotels near an airport? Where can I find hotels in Dominical that are near tourist attractions? There are an extensive range of accommodation options to choose from when you are planning your vacation in Dominical. Currently, Expedia's extensive database features 11 hotels within a short drive of Dominical's heart. Dominical offers visitors some handy lodgings, including the Villas Tekoa and Mavi Surf Hotel. Uvita, a popular Dominical accommodation neighborhood with 11 Expedia-listed establishments is 16 kilometres (10 miles) away. 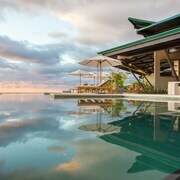 Accommodation options here include the Kura Design Villas and Rancho Pacifico. An alternative is Ballena. Ballena is where you'll find the Hotel Villas Gaia and La Cusinga Lodge. 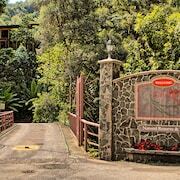 Or, try San Gerardo de Dota, where you'll find the Dantica Cloud Forest Lodge and Hotel de Montaña Suria. Ojochal is 30 kilometres (18 miles) from Dominical's downtown, while San Isidro de El General is 25 kilometres (16 miles) from central Dominical. 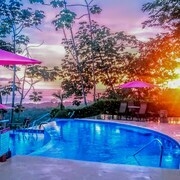 The El Castillo - Adults only and Alma de Ojochal can be found in Ojochal, while Hacienda AltaGracia, an Auberge Resorts and Hotel del Sur are situated in San Isidro de El General. If you are budget aware and are hoping to find the most affordable Dominical accommodation, our hotel database has affordable lodgings to consider in the area. The El Castillo - Adults only is 30 kilometres (19 miles) from downtown, while the Hotel de Montaña Suria is 35 kilometres (21 miles) away. Alternative lower-cost hotels are the Hotel Cuna Del Angel and the Alma de Ojochal. The Villas Alturas is 5 kilometres (3 miles) from the central part of Dominical. Alternatively, the Oxygen Jungle Villas is 16 kilometres (10 miles) away. You could also choose to book a room at the La Tierra Divina or the Villas Rio Mar. If you'd like to enjoy more of the beaches, forests and mountains in this section of Costa Rica, you could plan to spend time in other parts of Central Pacific Coast. Whether you engage in common activities, such as hiking, or just travel around to explore the attractions, you will be able to book comfortable hotel accommodation in the area. 95 kilometres (58 miles) to the northwest of Dominical is Jaco, where you can enjoy Jaco Beach and Herradura Beach. 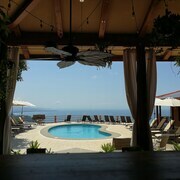 Expedia-listed Jaco hotels include the HRG Condos at Los Sueños and Los Suenos Resort Villas and Condos. 40 kilometres (24 miles) to the northwest of Dominical, you'll find Quepos, which is home to the The Preserve at Los Altos and Arenas del Mar Beachfront & Rainforest Resort. The Manuel Antonio National Park and Manuel Antonio Beach are a couple of the most popular sites to experience in Quepos. Tobias Bolanos International Airport can be found 85 kilometres (52 miles) away from Dominical. If you choose to stay close by, can book a night at the Real InterContinental Costa Rica at Multiplaza Mall or Costa Rica Marriott Hotel San Jose. 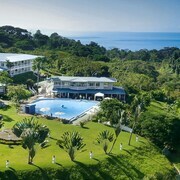 What are the most popular Dominical hotels? Are there hotels in other cities near Dominical? 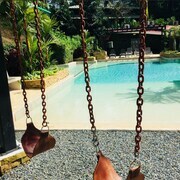 What other types of accommodations are available in Dominical? Explore Dominical with Expedia.ca’s Travel Guides to find the best flights, cars, holiday packages and more!